US PATENT 5,458,927: Process for the formation of wear- and scuff-resistant carbon coatings, Author: Malaczynski, Gerard W.; Qiu, Xiaohong ; Mantese, Joseph V.; Elmoursi, Alaa A. ; Hamdi, Aboud H ; Wood, Blake P.; Walter, Kevin C.; Nastasi, Michael A. US PATENT 5,817,326: Processing of hydroxylapatite coatings on titanium alloy bone prostheses Author: Nastasi, Michael A.; Levine, Timothy E.; Mayer, James W.
US PATENT 6,572,933: Forming adherent coatings using plasma processing, Nastasi, Michael A.; Walter, Kevin C.; Rej, Donald J. US PATENT 6,572,935: Optically transparent, scratch-resistant, diamond-like carbon coatings, He, Xiao Ming; Lee, Deok Hyung; Nastasi, Michael A.; Walter, Kevin C.; Tuszewski, Michel. US PATENT 6,572,937: Method for producing fluorinated diamond-like carbon films, Hakovirta, Marko; Nastasi, Michael A.; Lee, Deok-Hyung; He, Xiao-Ming. US PATENT 7,078.108 B2: Preparation of High-Strength Nanometer Scale Twined Coating and Foil, Zhang, Xinghang: Misra, Amit; Nastasi, Michael A.; Hoagland, Richard G.
Dr. Michael Nastasi is director of the Nebraska Center for Energy Sciences Research (NCESR) at the University of Nebraska-Lincoln (UNL). He is also the Elmer Koch Professor of Mechanical & Materials Engineering. Mike received his B.S. (1981), M.S. (1983) and Ph.D. (1986) degrees from the Materials Science and Engineering Department at Cornell University. 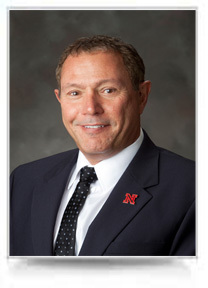 Prior to coming to UNL in January 2012, Mike was a laboratory fellow, staff scientist, and director of the Energy Frontier Research Center on Materials at Irradiation and Mechanical Extreme at Los Alamos National Laboratory (1985–2011). Position UNL to be more competitive for external funding from government agencies, private foundations, and the private sector. Mike’s personal research interests include ion-solid interactions, irradiation induced phase transformations, ion irradiation and plasma modification of materials, ion beam analysis of materials, synthesis and properties of high strength nanolayered composites, and surface mechanical properties. Mike’s work in these areas has resulted in several awards, including the 1995 Los Alamos National Laboratory Fellows Prize for his extensive research in ion-solid interactions and the R&D 100 Award in 1997 for Plasma Source Ion Implantation for Enhancing Materials Surfaces. He was appointed a Los Alamos National Laboratory Fellow in the summer of 2000, was made Fellow of the American Physical Society in 2006, and appointed fellow of Materials Research Society in 2011. Mike has served as an adjunct professor at Arizona State University, the University of Maryland, and the University of Colorado, and has been a visiting professor at the University of Helsinki in Finland. He has co-authored more than 500 refereed publications, which have been cited more than 6,000 times; authored the books entitled Ion-Solid Interactions: Fundamentals and Applications, published by Cambridge University Press in 1996, and Ion Implantation and Synthesis of Materials, published by Springer-Verlag, Berlin in 2006; and edited several volumes, including the MRS bestseller, the Handbook of Modern Ion Beam Materials Analysis. Handbook of Modern Ion-Beam Materials Analysis, 2nd edition edsY. Wang and M. Nastasi, (Materials Research Society, Pittsburgh, PA, 2009). Handbook of Modern Ion-Beam Materials Analysis, eds. J.R. Tesmer, M. Nastasi, C.J. Maggiore, J.C. Barbour, J.W. Mayer (Materials Research Society, Pittsburgh, PA, 1995). Ion-Solid Interactions: Fundamentals and Applications, Michael Nastasi, James K. Hirvonen, and James W. Mayer (Cambridge University Press, Cambridge, 1996). Beam-Solid Interactions: Fundamentals and Applications, eds., M. Nastasi, N. Herbots, L.R. Harriott, and R.S. Averback, Materials Research Society Proceedings, Vol. 279. 1993. Thin-Films: Stresses and Mechanical Properties VII, eds., R.C. Cammarata, M. Nastasi, E.P. Busso, and W.C. Oliver, Materials Research Society Proceedings, Vol. 505, 1998. Ion Beam Analysis and Modification of Thin Film High Temperature Superconductors, M. Nastasi, in Structure-Property Relations in Ion-Beam Surface Modified Ceramics-Theory and Practice, eds. C.J. McHargue, R. Kossowsky, and W.O. Hofer (Kluwer Academic Publishers, Dordrecht, 1989) p. 477. Thermodynamics and Kinetics of Phase Transformations Induced by Ion Irradiation, M. Nastasi and J.W. Mayer, Materials Science Reports 6 (1991) 1. Ion Beam Mixing in Metallic and Semiconductor Materials, M. Nastasi and J.W. Mayer, Materials Science and Engineering Reports R12 (1994) 1. Ion Implantation, K.C. Walter and M. Nastasi, in Kirk-Othmer Encylcopedia of Chemical Technology, 4th edition, Volume 14 (Wiley Interscience, New York, 1995) pp. 783-814.